Now that's a name from the past! In one of Amjad Iqbal's appearances for Pakistan, a World Cup qualifier against Iraq, the clamour of the 34,000 crowd was so great that he could not hear his colleagues. A similar problem has yet to arise with Bradford Park Avenue, but they are working on it. Park Avenue's past includes First Division football in the 1920s; FA Cup victories at Manchester City (8-2) and Arsenal after the Second World War, when they also took Manchester United to two replays, one drawing 83,000 spectators; launching the careers of Len Shackleton, Ron Greenwood and Kevin Hector; and the less auspicious chapter which saw them stripped of Football League status 40 years ago before folding four seasons later. However, it is the future of the reborn club which excites Iqbal. A 5-1 win at FC United of Manchester in midweek underlined Avenue's credentials as UniBond League champions-elect and tomorrow they host Leeds-based Guiseley in the first of two "six-pointer" derbies in a week against their main rivals. If they emerge in credit, they could be two promotions away from a return to the League by the start of next season. Bradford-born Iqbal, aka "Ammers", is also a chemistry lecturer. The college where the 29-year-old teaches is close to the site of the club's first home, Horton Park Avenue, which featured an Archibald Leitch stand and Craven Cottage-style "Doll's House". In 1944 it housed 32,800 for Blackpool's visit, making Avenue the only club to post a record attendance in wartime. Although the numbers cheering the push for a place in the Blue Square League North have stayed in three figures, Iqbal insists Bradford could soon have two senior clubs again. "The aim is to get back to the League in the next few years," the defender said. "The board realise that if we get promoted they'll have to find more funding, but there's a timetable for it all, including a possible move from Horsfall Stadium to a new stadium in the Thornbury area." Iqbal was captain of nearby Farsley Celtic when three promotions in four years catapulted them into the Blue Square Premier. Farsley were recently disbanded owing £750,000. "The football on the pitch moved too quickly for the club," he said. "They didn't plan to get so far so fast, but there's no danger of that here." Their plans are overseen by Bob Blackburn, the millionaire businessman who bought control three years ago and is now chief executive. Having become interested through his Avenue-mad brother-in-law, he was "touched" when he read up on the club. "Park Avenue is a sleeping giant. It's my job, and the board's, to wake it," Blackburn said. "When I came I said I wanted to be in the League in five seasons. We've got one promotion, with another possible now. That's me counting my chickens, but I'm confident we can achieve it." Why not get behind the existing League Two club, Bradford City? "I'm a guy who likes to start from grass roots but we'd like to have that rivalry again. I'd like us to be the superior side in the city in the next few years. There's every possibility it could happen. It's the dream of all Avenue fans who ended up supporting City, Leeds or Huddersfield [after the club closed in 1974]. I look on message boards and there's disgruntled City fans. If they came to watch us, it's good football at an affordable price and a nice, family atmosphere with no segregation." These are heady times for several clubs, including Newport County and Halifax Town, who were resuscitated after being pronounced dead. Their inspiration, according to Blackburn, and Avenue's manager, John Deacey, are Accrington Stanley, who returned to the League 44 years after leaving. "Accrington have done fantastically and we'd love to emulate them," said Deacey, who has transformed an underachieving side since being elevated from the No 2's job last autumn. His blueprint is a more gradual one should Avenue win the one automatic promotion spot. "You can get to the Conference too early," he said, recalling his time at Farsley as assistant manager. "You must have the structure of the club in place. If we're looking to the future, I'd stress that to the board. The fan base is around 500 now but that will grow. For the Conference North you need 700 and you can't go into the Conference with less than 1,000. Bradford City have been clever with their cheap season tickets, and we have to think about how we attract the younger generation." One of the old guard from the 1950s, Kevin Hainsworth, is now an Avenue director. In 2007 he and eight other fans spent five days at Lord's helping remove 1,600 unwanted seats from the Tavern Stand which they then installed at Horsfall. Television commentator John Helm is a devotee of similar vintage. The son of a City supporter, he became besotted with Avenue after noticing the original stadium's grandeur on being taken to watch Yorkshire play the Australians at the adjoining cricket ground in 1953. He saw triumphs, bigger crowds than City and then relentless decline after the club sold future England forward Hector cheaply to Derby, plummeted to the foot of the old Fourth Division and were voted out in 1970. Now vice-president, Helm "fought back tears" as he covered their expulsion for Radio Leeds. Yet when diehard green-and-whites re-formed the club in 1988, starting in the West Riding County Amateur League, his passion was rekindled. Iqbal maintains the present squad is "good enough to win the next league too". But could Bradford Park Avenue really make it back to the League? "Oh yes," Helm said. "The joke is that we'll pass Bradford City on their way down." Gianni Paladini to QPR Report: "I would like to thank you for all your time and efforts that you put into QPR. I think you are doing something useful and informative for the club and the supporters." I'm into my football history and it would be BRILLIANT to see them back in the football league one day. 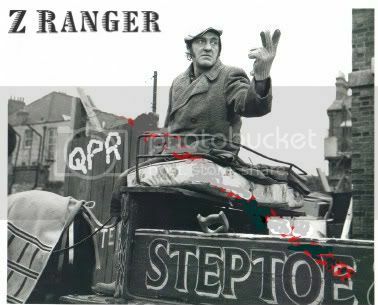 "I want Loftus Road to Become a Fortress"..."We Want 7, We want 7, We want 7....."
Yeah, I well remember PA and Accrington Stanley going bust. Lost two good small Clubs with distinctive names, and in PA's case, quite a colourful strip. Bradford was more like a Scots town colours-wise, with that amber and maroon at City and the green and white at Park Avenue. I'm always a bit concerned when they're talking about more funding. They always sound a bit like a lazy window cleaner, who wants people to lend him money to live well so he won't have to clean windows, when cleaning windows is all he knows how to do. Funny how they never say they'll have to learn more to do better. Or to become more talented. But they never do. No wonder more Clubs are shaping up to do what seemed rather rare then. Emulating Accrington and Bradford Park Avenue. You sometimes see (Park Avenue) in brackets, as if it isn't actually the Club's name, just a way of distinguishing them from City. But the old Caxton four volume history of football will list the changes! Don't forget Aldershot who went bust in the late 80's - and i believe maidstone is also on the rise. These are all teams who refused to die - and you can add in the likes of Wimbledon AFC. Although the FA/FL did their best to try and destroy Luton with some of the most insane point deductions that I ever witnessed - and I hope will never see again - the team that every QPR fan seemingly loves to hate have actually thrived in the Conference League with a fan base of still around 5 to 6k. So there is a massage out there somewhere. Who can ever forget Newport County reaching the quarterfinals of the Cup Winners Cup in the early 80's? While I don't remember Accrington going bust, I do remember many others disappearing from the Football League. BTW Worthington is a beer, it was Workington who went out, to be replaced by Wimbledon. welcome to the board qpr4me. As a youngster I always looked out for their results, as I thought it was an odd name for a football team. Always 4th division and in those days relegation from the league was not a given, the team that finished bottom of the 4th division had to apply for re-election. One year it wasn't given, so that was the end of Barrow. Barrow made way for Hereford United. It was the bottom four of the old 4th Division who had to apply for re-election. I believe Crewe hold the record with 12 re-election applications, all successful! Hi all, am usually to be found on Vital QPR, but thought maybe it's time to spread out, rather like my waist! Vital is a good site, Adam and his team do well on there. Most sites are not too bad TBH, Different sites have different perspectives. You will like this site, it is constantly evolving and no one assumes that they are in the know - unless of course they have had a close encounter of the 3rd kind with someone at the club. So carry on visiting and posting, it is welcome. Nicknamed, the Stans. Strip, white with green trim. The Stans [ or Avenuites] were formed in 1907 by members of the Bradford Rugby Club. Based at Park Avenue, the team joined the Football League after one season , in 1908, and in 1914 began a three year stint in the First Division. In 1953 the club was on the search for a new manager and ended up with a shortlist of two names. The club choose Norman Kirkman. who stayed for one season before moving on to become a baker. The rejected applicant was Bill Shankley. Probably changed their history. In 1964 Jim Fryatt scored what is the fasted league goal ever recorded against Tranmere Rovers, in just Four Seconds. Re-Election. Hartlepool hold the record, having to re-apply 14 times, followed by Halifax Town and Barrow. with 12. Found a photo of an old QPR v BPA programme but can't copy it. Ha ha ha, yes, probably never thought Shanks would ever win anything (as he hadn't up to that point). The north west team known as the Reds that Bill Shankly was manager of was, of course, the aforesaid Workington Town, my dad's home town team. Apparently there was some other north western Reds he was involved with, but the name slips my mind. Barrow was my other half's dad's home town team, not that he was interested in football, more of a cricket chap. "In sports, what is true is more powerful than what you believe, because what is true will give you an edge" - Bill James. "...On 31 May 1907 the club applied for membership of the Football League but were unsuccessful. Undaunted they then applied for the vacancy created in the Southern League by Fulham's elevation into the League and having been accepted, set about creating a worthy ground. A suggested merger with City came to nothing but the renowned Glasgow architect Archibald Leitch who had been responsible for Hampden Park and other major grounds was employed. His finished work would be capable of holding 37,000. The club also entered a team in the North Eastern League and the first game played at the new Park Avenue was on 2 September 1907 when the first team beat Newcastle United Reserves with around 6,000 watching. The first Southern League fixture was at Elm Park, Reading and saw a 3-1 winning start. Another win at Watford followed and on 14 September 15,000 turned up to watch them complete a quick double over Watford with a 3-2 win. Results then tapered off. "In February Tottenham announced they were quitting the league at the end of the season and Queens Park Rangers and Bradford followed. The result was a bitter battle between the clubs and the league. The AGMs of the Football League and the Southern League were the same day, 27th May. Bradford resigned from the Southern League and the other two clubs were expelled. Fortunately the Football League accepted Bradford into the Second Division while QPR withdrew at the last minute and were accepted back into the Southern set-up but made to play most of their games midweek. Spurs were rejected by the Football League and remained in limbo until mid June when Stoke had second thoughts about Division Two and resigned..."
Cheers Mark, beautiful, just beautiful. The old Hammersmith badge and all. Looks like it is Bradford, even though Park Avenue was often added even if it wasn't part of the official name. My dad always used to write the team changes on the programme, which made sense, I suppose, but I hated it. Checking Soccerbase, it was indeed Bradford PA...and we lost 2-1! www.soccerbase.com/results2.sd - Alec Stock's Blue and White Army! Typical, we lose to the bottom dwellers!